[178 Pages Report] The global shotcrete/sprayed concrete is projected to be worth USD 8.30 Billion by 2021, registering a CAGR of 8.0% between 2016 and 2021. In this study, 2015 has been considered as the base year and 2021 as the forecast year for estimating market size of shotcrete/sprayed concrete. To analyze and forecast the global shotcrete/sprayed concrete market, in terms of value (USD million) and volume (thousand cubic meter). To estimate and forecast the market size on the basis of four regions, namely, Europe, Asia Pacific, North America, and Rest of the World. 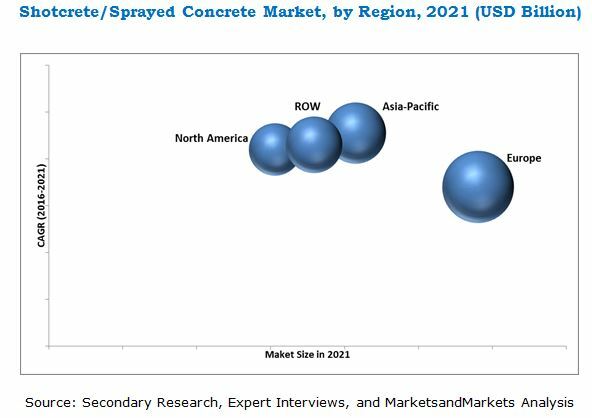 To provide detailed information about the key growth factors (drivers, restraints, opportunities, and challenges) influencing the growth of the shotcrete/sprayed concrete market. To analyze and forecast the size of the market on the basis of process, system, and application. Core competencies* of the companies are determined in terms of their key developments and key strategies to sustain in the market. This research study involves extensive use of secondary sources, directories, and databases, such as Hoovers, Bloomberg, BusinessWeek, and Factiva to identify and collect information useful for this technical, market-oriented, and commercial study of the shotcrete/sprayed concrete market. The primary sources are mainly industry experts from the core and related industries and preferred suppliers, manufacturers, distributors, service providers, and organizations related to different segments of the industry’s supply chain. The bottom-up approach has been used to estimate the size of the shotcrete/sprayed concrete market on the basis of process, system, and application, and region in terms of value. The top-down approach has been implemented to validate the market size in terms of value. With the data triangulation procedure and validation of data through primaries, the exact values of the overall parent market size and individual market sizes have been determined and confirmed in this study. The shotcrete/sprayed concrete is led by major players such as BASF SE (Germany), Sika AG (Switzerland), HeidelbergCement AG (Germany), Cemex S.A.B. de C.V. (Mexico), KPM Industries Ltd (Canada), Euclid Chemical Company (U.S.), LKAB Berg & Betong AB (Sweden), Quikrete Companies Inc. (U.S.), U.S. Concrete, Inc. (U.S.) and LafargeHolcim (Switzerland). This research report categorizes the shotcrete/sprayed concrete market based on system, process, application, and region, and forecasts revenue growth and analyzes the trends in each of the submarkets. These segments are further described in detail with their sub segments in the report with value and volume forecasts till 2021. The market size of shotcrete/sprayed concrete is projected to reach USD 8.30 Billion by 2021, at a CAGR of 8.0%. Rapid developments in technology and raw materials, economic and technical efficiency of shotcrete, increase in underground constructions activities such as mining and tunneling are the key drivers for the growing shotcrete demand. Wet mix and dry mix are the two major processes of shotcrete. These processes are used by many end-use industries to fulfill the growing demand for quality low-cost housing. The wet mix process dominates the global shotcrete market, in terms of value, and is projected to remain the fastest-growing segment by 2021. Underground construction is the largest application of the shotcrete/sprayed concrete market, followed by water retaining structures, repair works, protective coatings, and others (free formed structures and new constructions). Growth in underground construction is primarily driven by increasing urbanization, fast growing economic development, and underground transportation, mainly in developing countries such as India, the Philippines, Egypt, and Indonesia. Europe is the largest market for shotcrete, which accounted for the maximum share of the overall market, in terms of value, in 2015. This market share of Europe is attributed to rapid developments in shotcrete technology and raw materials, and increase in tunneling and mining activities. Asia-Pacific is the fastest-growing market, which is projected to register the highest CAGR of 9.1%, in terms of value, during the forecast period, owing to the growth in population, increase in consumer preferences, and changing lifestyle, which result in construction of dams, subways, highways, bridges, tunnels, and other infrastructure, thus driving the shotcrete market. The shotcrete industry is seeing high research activities to create new equipment and minimize human intervention. One of the major inhibitor is the lack of technical expertise in the industry, which raises health and safety issues. BASF SE (Germany), U.S. Concrete, Inc. (U.S.), Sika AG (Switzerland), HeidelbergCement AG (Germany), and Cemex S.A.B. de C.V. (Mexico) are some of the key players of the market. The diverse product portfolio, strategically positioned R&D centers, continuous adoption of development strategies, and technological advancements are some of the factors that strengthen the market position of these companies in the shotcrete/sprayed concrete market .They have been adopting various organic and inorganic growth strategies to enhance the current market scenario of the market. 12.2 Cemex S.A.B. De C.V.
12.6 GCP Applied Technologies, Inc.